You need for everyone attending the discussion to have read the book (or up to the chapter you are discussing, in the 9-part series) – no short cuts! You need to have worked through the guide, making decisions for yourself. You are welcome to print out any of the materials you wish. You can also run the entire session carbon-free. You need a quiet, well-lit room with comfortable seating for the discussion itself. Set up a flip-chart or white board. 1. Make sure everyone introduces themselves if it is a new group. Then throw out a “warm-up question” that everyone in the group should answer, before digging into the written questions. We find that the following opener is generative: “What is your exclamation mark and your question mark after reading the book?” ie what surprised them, and what question do they have? Have everyone in the group answer this briefly. 2. Whether discussing the whole book or a part of it, we recommend building a group “re-cap” on the white board. Either chapter by chapter, or section by section, have everyone contribute to a brief summary of the book’s main topics. This way everyone will be reminded of what they read, and will feel that they are building a shared picture. Don’t take more than 15 minutes for this. 3. Begin the conversation using the questions in the Structured approach, or by going for the Free-range approach. The advantages of the structured approach is that it enables you to cover wide aspects of the book, and not get stuck into narrow issues into which a free ranging conversation may flow. The structured questions are also there to allow the conversation to take place in the context Shavit intends: what is the meaning and future of Israel to the Jewish People? Follow the questions. But don’t forget that you are aiming to build a flowing conversation, and not a staccato question/answer session. So feel free to alter the order of the questions, to dwell more on some than others, skip over some, and add your own. Depending on the nature of the group and your familiarity with them, you might ask everyone to print out two quotations from the book before they arrive: One quotation that they wholeheartedly agreed with, and one with which they strongly differed. Have them post them up on the walls of the room. Give time for everyone to look at each other’s choices. An entire session could be given over to giving everyone space to explain their choices. 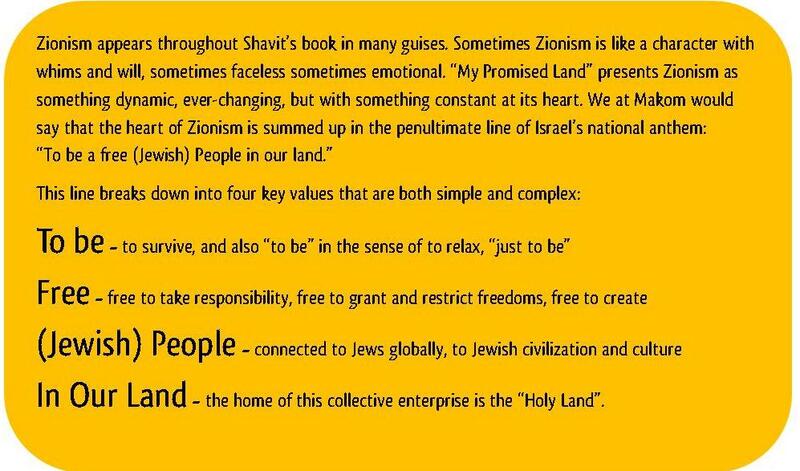 Place four signs up around the walls: To Be, Free, Jewish People, and In Our Land. Either at the end of the entire discussion, or after each person has talked about their chosen quotations, ask everyone to post each quotation under the appropriate Zionist value. At the end of the session the facilitator may draw attention to the various quotations under the four different headings. They will act as a powerful reminder of the values that underlie the Zionist enterprise, and also as a rich embodiment of how argument and multi-vocality enlivens its future. “Working with the conversation units” guide.